The Leica TL2 is a stylish new compact system camera with a 24 megapixel APS-C sensor. Manufactured from a single block of aluminium, the Leica TL2 offers an innovative touchscreen 3.7-inch display, Maestro II series high-performance image processor, built-in Wi-Fi connectivity, a flash hot shoe, 4K video recording, 49-point AF system, full range of advanced controls from manual exposure to manual focus, sensitivity range of ISO 100-50000, maximum shutter speed of 1/40000th of a second, JPEG and DNG RAW file support, 32GB internal memory, and an impressive continuous shooting rate of up to 20fps using the new electronically controlled shutter. 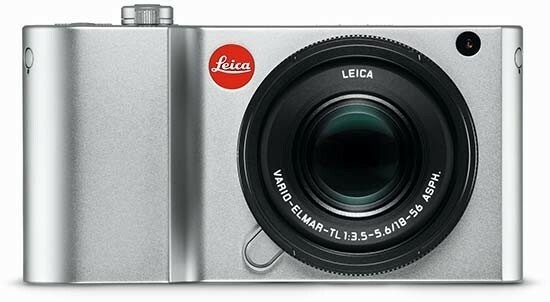 Available in black or silver, the recommended retail price of the Leica TL2 is £1700 / $1950 body only. 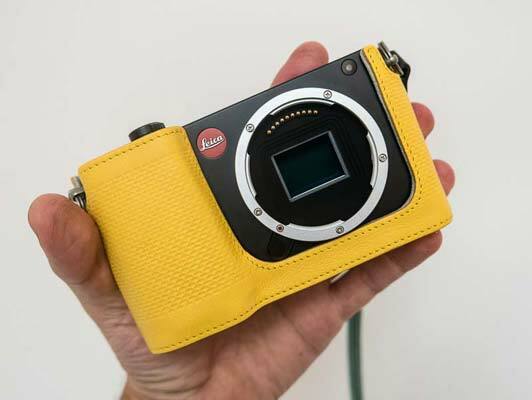 If you’re in the market for a Leica you probably already know what you want from the camera – and won’t baulk at the asking price. 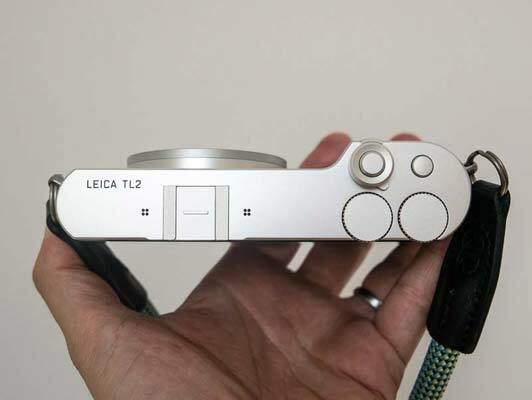 The mirror-less Leica TL2 replaces the former TL model (which we reviewed back in January), previously launched at £1470 as opposed to the new TL2’s body-only asking price of £1700. Unlike before, there’s no titanium-bodied option to go for this time around – the TL2 limits your choice to either silver or black, at least for now. There is however a selection of body protectors and straps in various eye catching colours to accessorise with. In terms of design and operability, official dimensions are an exact match for its predecessor, with the TL2 measuring 134x69x33mm. Weighing 399g with battery and 355g without, what we don’t get, however, is any flash neatly integrated within the camera. Like its predecessor, the Leica TL2 is a model of minimalist elegance, complete with recessed lugs for strap attachment, and again cleverly fashioned from a single block of aluminium with few buttons on display to disturb its clean lines. Here it’s all about the large smartphone-like touchscreen, taking up the entire real estate of the backplate. Indeed, Leica sees the TL2’s target audience as being the existing smartphone user who appreciates good design and now wants to ‘step up’ to a proper camera, without being put off by a bunch of physical controls that may be tricky to determine for a photographic newbie. Keep things simple seems to be the message here. That’s not to say the Leica TL2 is any slouch when it comes to either features or their implementation. With its maker claiming that, despite outward appearances, it's a very different beast when compared with its forebear, new this time around is a 24-megapixel CMOS sensor, which is once again APS-C format. This is a pixel hike when compared to the original TL’s 16-megapixel resolution, again from an APS-C chip. So already with the TL we’re edging closer to the sort of spec you’d expect from most DSLRs these days – and the sort of performance you’d expect for a £1700 outlay. 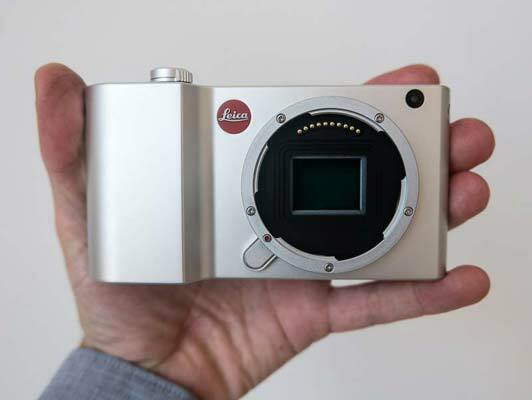 As well as a new sensor, this latest Leica features a new generation processor, which has enabled the response of its touch screen to be 8x faster than the original TL. On top of this it’s now claimed to be 5x faster to power up than before. That being said, if you’re buying a Leica you’re probably envisaging a more considered approach to image creation and after something of a lifestyle accessory, rather than ‘merely’ looking for the fastest CSC on the block. 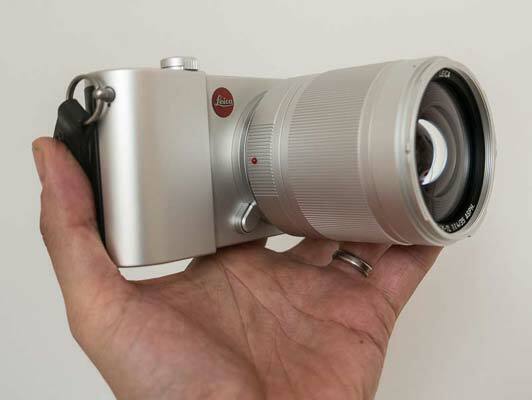 Whilst the Leica TL2 may be light on actual physical controls, with lens attached – we had a wide-angle 11-23mm zoom to play with – it nevertheless feels substantial in the palm. Given its outward elegance, it’s a shame, then, that the first thing you do when picking it up is unavoidably leave dirty great thumb prints on its 3.7-inch backscreen (the same size as the one found on the TL). The camera doesn’t have much (if any) of a surrounding screen ‘bezel’ to otherwise provide purchase for the fingers. While there is enough of the grip provided to enable the user to get a decent hold, this is, like its predecessor, a rather subtle implementation as far as grips go. This means that, although it is possible to hold the camera and lens in one hand when shooting, you will feel more secure and comfortable using two. As noted earlier, what’s missing here is a flash of any variety built into the camera (which, perhaps those trading up from a smartphone, or anyone who cast an eye over its predecessor’s spec might expect to find included), with instead a vacant hotshoe provided. Likewise omitted is any eye level optical viewfinder or EVF, though we can buy a Leica Visoflex Type 020 EVF as an optional extra. All that being said, the 1.3 million-dot resolution of the provided LCD provides a very ‘life like’ relay of the scene before the lens. Move off Auto, and manually selectable ISO range this time around stretches from ISO100 to ISO50000 equivalent, while it’s now possible to shoot DNG/Raw files separately from – or in tandem with - JPEGs on the TL2 (it’s also possible to shoot standalone JPEGs, naturaly). Aside from shooting Full HD video, we get the new option to capture 4K video too, at 30fps. As there is no obvious video record button on this model, however, how this is implemented is at first a little confusing. A read of the manual however suggests a swipe of the finger horizontally across the screen when in photo mode will switch the camera to video mode instead. Then it’s simply a case of squeezing the shutter release button to commerce (or end) filming. Bringing things similarly up to date, the Leica TL2 has integral Wi-Fi, with Leica providing a dedicated TL app for Android and iOS phones. More unusually for a dedicated digital camera these days – and again seeming like a nod to the smartphone market – the TL2 comes with a built-in 32GB internal memory. That’s exactly the same data capacity as the previous TL model. Plus, of course, there’s the ability to expand this with the insertion of an SD card beneath the flap on its right hand flank (if viewing the camera from the back) – a space also shared with USB and HDMI ports. As we noted with our review of the original TL, both it and the TL2 are directly compatible with half a dozen dedicated ‘TL’ lenses; three prime lenses and three zooms, as well as ‘SL’ optics thanks to a shared L bayonet mount. Via adapter both the earlier TL and new TL2 are further compatible with Leica M and R series lenses. Examining the Leica TL2 more closely, from the front it resembles the very pinnacle of minimalism, with the lens mount dominating proceedings. Top left of this is the iconic red and silver Leica logo, prominently displayed, plus, top right of the lens a familiar AF assist/self timer window. Just below the lens, and slightly hidden by it, we find a lozenge-shaped lens release button. As we mentioned earlier, we don’t get an eye level viewfinder nor body integral flash on the TL2, with instead there being a vacant hotshoe provided for the attachment of both that’s protected by a slip-off cover when not in use. This is, in turn, flanked either side by stereo microphones. Moving to the Leica TL2’s top plate, the other controls here are a raised and nicely springy shutter release button, encircled by a lever for switching the camera on and off. Next to this obvious and prominent control we find the unmarked function button, and set behind this again, resembling a DJ’s twin turntables, are a further unmarked pair of control dials the size of five pence pieces. These are set flush with the top plate, yet protruding slightly at the back, so their ridged edges make contact with the fleshy pad of your thumb. These dials enable the user to scroll through menu options and settings, otherwise selected via a swipe or tap of the finger directly on the screen. So pretty much everything, apart from turning the camera on, can be controlled via the LCD rather than physical buttons. 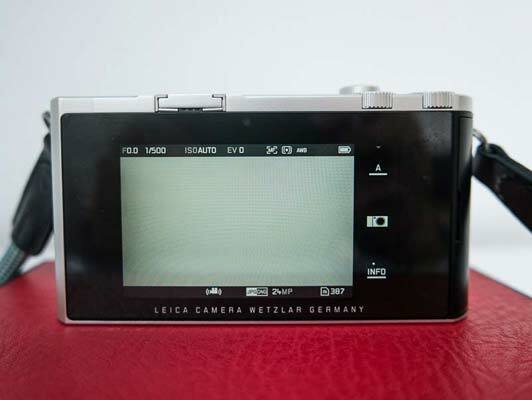 The rear of the Leica TL2, as noted, is swallowed up by its LCD screen, with a plastic flap, raised via application of a thumbnail, positioned to its far right – when viewed from the back. This covers vacant slots for optional SD card, USB and HDMI ports. The opposite flank of the camera features a built-in speaker and apart from a hole for attaching a strap, that’s it. The bottom of the camera has a centrally located screw thread for use with a tripod, next to which is a slightly sunk lever for popping open the battery compartment to remove the rechargeable cell from the camera and instead slot it into the mains charger provided. On our sample, the battery didn’t seem to visibly sit flush up against the contacts within the charger itself, though the indicator light still glowed red and then, eventually, green, reassuring us everything was working correctly. To get started, flick the power lever atop the Leica TL2 to the on position, indicated by the presence of a small red dot on the body work, and the TL2 powers up quickly. We wouldn’t say it’s instantaneous, but it’s swift to respond none-the-less. The back screen image reveals itself with no noticeable lag or ghosting when panning around the scene. Half squeeze the shutter release button and after a brief moment’s pause we get the on-screen AF point changing from aqueous blue to green, signifying that the camera has found its target. It’s worth noting, as we found with original ‘TL’ model, that the screen is impressively clear and life-like in its relay of colour and detail. So much so that after a while we started forgetting that the TL2 again missed an eye level viewfinder. In its absence you simply get on with it. Take the shot and the screen freezes to display the photo being written to memory for a couple of seconds, before it vanishes and the real-time scene in front of the lens resumes. In line with most Leicas, the TL2 feels most apt for those with a more considered approach to image taking. After all, if you're in the market for a Leica then you’re going to want to savour every moment of using it. While the omission of a dedicated playback button (like the omission of a video record button) may throw the uninitiated at first, a simple finger swipe up or down on the backscreen (rather than left to right) will call up previously captured images. With most of the Leica TL2’s operation centering around use of the LCD screen, you might expect it to be crammed with options. But here too things are kept fairly streamlined and minimalist in approach. Key options are presented in a panel at the right hand side of the screen. The top option is the shooting mode. As expected a press of this presents further familiar options in Program AE, Aperture Priority, Shutter Priority, Manual priority and a fifth option – being a smattering of scene modes, which illuminate in red as you touch upon them. Here we find a fully Auto shooting option, along with presets for shooting sports, portraits, landscapes, night portraits, snow/beach scenes, fireworks, candlelight, sunset and, most unusually, a digi-scoping preset. This selection is exactly the same as that previously found on the TL. Of course we also get access to the Leica TL2’s set up modes via the same screen, by selection the next icon down on the side toolbar, denoted by a stills camera graphic. Tap this and we’re provided with a grid-like array of virtual buttons, each large enough to respond to a finger or thumb press without the user accidentally selecting the adjacent control. Viewed from top left of screen to button right, the first virtual button provides access to light sensitivity settings including auto and otherwise running from a manually selectable ISO100 to ISO50000 (up from its predecessor’s 12600), which is plentiful. The next virtual button along provides access to the Leica TL2’s metering selections. Like the TL before it, the three options here are Spot, Multi Field Metering or Centre Weighted. Moving right again on screen the third button along governs exposure compensation; again, as with the original TL model, the TL2 offers a standard +/-3EV gamut. Moving down to the next row of three menu buttons, the first denotes shooting file formats. User selections are either standalone JPEG shooting, JPEG + DNG files combined, or DNG file capture on its own. The advantage of DNG files over standard Raw format is of course that they can be opened in just about any software and quickly too; we were able to use the built in Adobe Preview software that came with our iMac to open one as easily as we’d view a regular JPEG, for example. In terms of the on-screen menu, user-selectable resolution is up next, ranging from 6 megapixels if you really get caught short of memory, up to the full 24-megapixel capture (with a 12 megapixel option slotting in between). The adjacent button to the right of this controls white balance, with the usual automatic and user-customisable selections offered. Continuing along the options we find further buttons governing self-timer, Wi-Fi implementation and video resolution (4K, solo motion, 720P or 1080P capture). The options don’t end here however. The last button on the screen is a ‘+’ mark. Press this and we get access to drive modes (either single shot or continuous) and as well as what Leica terms Film Mode – being a bit like Fuji’s own film simulation modes on its cameras. The Leica TL2’s regular default option is Standard, whilst we also unsurprisingly get Vivid, Natural, B&W Natural, plus B&W High Contrast. Sub options here also include the ability to adjust Contrast, Sharpness and Saturation for each. As noted earlier a mains charger for the lithium ion battery provided is included out of the box. To retrieve the battery, the battery release catch/lever at the base of the camera has to first be turned/thrown, at which point the ‘head’ of the battery pops up. A downward press on this subsequently releases the battery fully from the camera. Battery life is a respectable 400 images, or 160 minutes of video.